The Red Bull Tour Bus travelled to Amity University, Gurugram, for one last gig in 2017. Delhi-based DJ and producer Sartek and Mumbai-based dance music duo Zenith both made their debut atop the bus, and played to over 1000 fans, for a final party with the gig machine before the year winds up. Opening proceedings for the night were Zenith, whose set list included remixes of popular EDM tracks, and had the students of the university dancing from the get-go. Up next was Sartek, who, in a few years, has achieved a level popularity reached by few. Having first become interested in dance music while studying to be a chartered accountant, Sartek soon realised this was his calling, and is now recognised as one of the foremost DJs in the country. 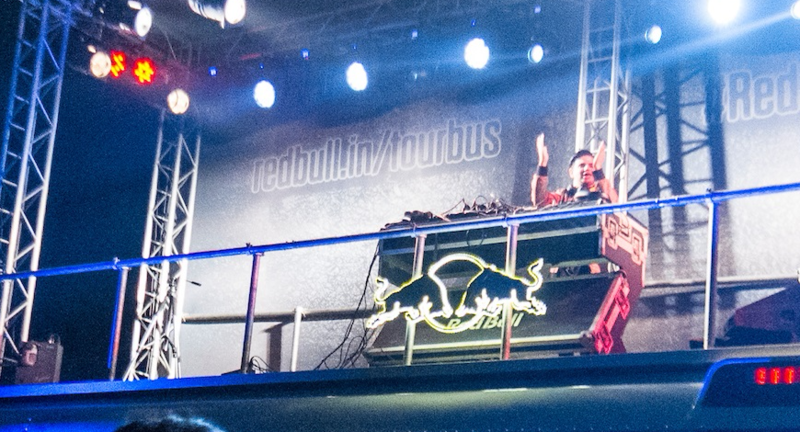 Picking up from where Zenith left off, Sartek continued to play high-energy dance music, ensuring every single attendee was dancing, and left the students asking for an encore as he wound up the final Red Bull Tour Bus show for the year. The Red Bull Tour Bus will return in 2018 for yet another fantastic year of gigging across the country.